I realised a few days ago, that of all the many song lists, I have not compiled a list of songs featuring one of my favourite actors – Sunil Dutt. 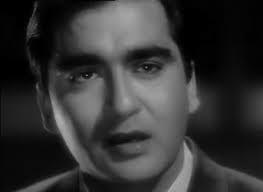 Sure enough, many of his songs have regularly featured in other lists on my blog (also primarily because he has acted in so many songs penned by my favourite lyricist, Sahir Ludhianvi, or for that matter, that very underrated music composer, Ravi). But there hasn’t been a separate Sunil Dutt post. To rectify this and to mark his 10th death anniversary (May 25th) and 86th birth anniversary that is just round the corner (June 6th), here is a post dedicated to Mr Sunil Dutt. This has been a particularly tough list to compile. More so, because Mr Dutt had some lovely numbers picturised on him. Yes, there will be songs that would have featured elsewhere and find a mention here also.. Can’t help that. All the songs below (excepting the last one) are solo songs sung by Sunil Dutt on screen – this rules out Aage bhi jaane na tu (which otherwise would have crept into this list, as it has into many others!) or for that matter, that lovely Sudha Malhotra classic Tum mujhe bhool bhi jao. Time-permitting, I will follow this post up with a Sunil Dutt duets soon. 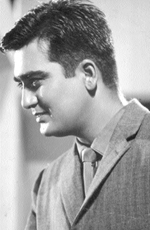 For now, here are 10 of my favourite Sunil Dutt songs. 1) Jalte Hain Jiske liye (Sujata, 1959, Talat Mahmood, S.D. Burman): Starting the list with the telephone song. What a beautiful song that too – Talat’s haunting voice, Burmanda’s incomparable music and Majrooh’s lovely lyrics. What is of note here is Sunil Dutt’s acting – he is perfect as the sweet, gentle lover, offering his affection to a woman who doesn’t consider herself worthy of these affections. 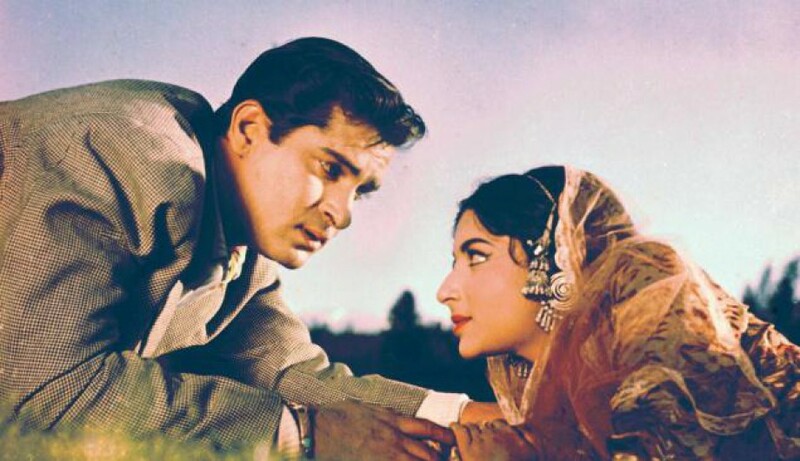 This was Nutan’s movie – but even though the heroine had an author-backed role, Sunil Dutt stands out as the liberal, sensitive Brahmin man – who has fallen in love with an untouchable and wants to marry her. 2) Itna na mujh se pyar badha (Chhaya, 1961, Talat Mahmood, Salil Chowdhary): I associate this movie with Sujata. For one, the plot is somewhat similar. Both movies had fantastic music. And they were directed by Bengali directors. And they starred two heroines I am very fond of (Nutan and Asha Parekh). And yes, they both had a very good-looking Sunil Dutt. So, but naturally, this “inspired” (a direct lift from one of Mozart’s symphonies) song from Chhaya is the next song on the list. I was a little torn between this lovely adaptation and Aansoo samajh ke kyun mujhe but chose the former. Itna na mujhse pyar badha comes twice in the movie – there is the happy duet and this sad version. Talat sings it wonderfully, filling it with pathos and unhappiness. And Sunil Dutt emotes effectively – his unhappiness and sadness is conveyed subtly. Oh yes, he looks gorgeous! 3) Chalo Ek Baar Phir Se (Gumraah, 1963, Mahendra Kapoor, Ravi): Next is an all time favourite penned by Sahir that has featured in many many lists before this. But what a song! The music, singing, and lyrics are just perfect as they convey the anguish of a man who is trying to put a past relationship behind him, knowing fully well that it is difficult and is unable to. Sunil Dutt’s acting is spot-on. He starts off in a smiling, casual manner – hiding the pain and not letting it show in the beginning. And then, the veneer cracks – and one gets to see the pain and the anguish. He is simply superb as the bitter but passionate lover who is in much pain. 4) Tum agar saath dene ka vaada karo (Humraaz, 1967, Mahendra Kapoor, Ravi): Another song from the B.R. Chopra camp – starring Sunil Dutt, penned by Sahir, and music by Ravi. A good suspense thriller with lovely songs, Humraaz was a very watchable movie – my only grouse was that it starred a terribly wooden Vimi! This is a beautiful romantic number, picturised in the scenic locales of the Himalayas, and has Sunil Dutt at his romantic and intense best. 5) Yeh wadiyan yeh fizayen bula rahi hain tumhe (Aaj aur Kal, 1963, Mohd Rafi, Ravi): A beautiful Rafi song picturised on Sunil Dutt and Nanda (who looks particularly lovely). The situation of this song is tender, gentle and encouraging rather than romantic. Sunil Dutt plays the gentle, kind doctor who is trying a shy, morose wheelchair-bound Nanda to get up and stand. 6) Ram kare aisa ho jaaye (Milan, 1967, Mukesh, Laxmikant-Pyarelal): I am no Mukesh fan, but I really like this emotional lullaby from this reincarnation saga. Sunil Dutt sings this plaintive number with a lot of emotion, as a distraught Nutan tries to sleep. It is a sweet, loving moment from the film, as far as I remember. 7) Jab dekh liya unhein dhoondh hi lenge (Chirag, 1969, Rafi, Madan Mohan): The next song is from this godawful tearjerker opposite Asha Parekh, made in 1969. While the movie’s most famous song is the sweet Teri aankhon ke siva duniya mein rakha kya hai, which appears twice – once as a happy ‘duet’ (with Lata Mangeshkar, even though she sings just one line) and once as a pure Lata solo, the song listed here, sung by Dutt on-screen, is a not a well-known number. Jab Dekh liya has Asha Parekh wearing pink and perched on a cycle (aka Pukarta Chala hoon main) While I love Pukarta chala hoon main more for the music and singing, Sunil Dutt does a far better job in this song in terms of acting than Mr. Biswajeet! 8) Koi mujhse pooche (Yeh raaste hain pyaar ke, 1963, Rafi, Ravi): A bold movie of its time, this was based on the controversial Nanavati case of 1959, where a naval commander was tried for the murder of his wife’s lover (and childhood friend), Prem Ahuja. A jury acquitted Nanavati, a verdict which was then squashed by the Bombay High court. This drama in the courts led to to abolition of the jury trials in India. This 1963 movie was based on this controversial case with Sunil Dutt reprising the role of the hot-headed naval commander. It also starred the beautiful Leela Naidu, playing the foreign born Neena and Rehman as the philandering friend. Leela Naidu’s character is depicted as an innocent woman who gets seduced by the bad Rehman and in a bid to atone her sins, commits suicide in the end. Sunil Dutt is convincing as the angry husband who goes on a shooting rampage! The movie was rather painful, in terms of the execution, but had some lovely songs. This one here is a slow, melodious, plaintive song sung very well by Rafi. 9) Mere saamne wali khidki mein (Padosan, 1968, Kishore Kumar, R.D.Burman): This crazy number from the comedy Padosan is an illustration of Sunil Dutt’s versatility. At the time when Dutt was playing the dashing leading man in his other movies, it is remarkable that he ventured to play Bhola, a dumb, idiotic simpleton here. This is a funny number as Sunil Dutt lip synchs the tune to impress his neighbour! 10) Chhodo kal ki baatein (Hum Hindustani, 1961, Mukesh, Usha Khanna): Yes, Yes, I know. Technically, this should not be on this list. Sunil Dutt does not sing this on-screen. But I simply had to have it here. So ending this list with this idealistic, patriotic song full of hope from the Nehru era. And somehow I can ‘see’ Sunil Dutt singing this earnestly! This is his song! This entry was posted in Old Hindi songs and tagged Asha Parekh, B.R.Chopra, Gumraah, Humraaz, Mahendra Kapoor, Mukesh, Nutan, Rafi, Ravi, S.D.Burman, Sahir Ludhianvi, Sunil Dutt, Usha Khanna. Bookmark the permalink. Yay, I know two songs on this list – the last two. I think my mum used to hum it every once in a while. Good post H! Nice list. 🙂 He did play many progressive characters, didn’t he? p.s. Corrected myself on your previous post. You were right. I used to like Rang aur noor ki baraat… till I watched the movie. Hated the movie and do not like the song now. Aah, I have forgotten how Nainonwali tere naina sounds. Will listen to it now. The only song I remember from that movie is Radhike tune bansuri churayi And that was on my shortlist. Lovely list, Harini (and that I should approve of it should come as no surprise, since so many of the songs you chose are also the ones I chose for my Sunil Dutt list!) Another song that I like a lot – though also from Gumraah – is Aa bhi jaa. That echo effect is beautiful, and Sunil Dutt portrays longing, impatience, and a deepening sense of disappointment brilliantly. Such a good actor, and so swoonworthy too. My sister and I used to wonder: how did two people with the genes of Sunil Dutt and Nargis manage to have a son like Sanjay Dutt?! Ha ha actually I have wondered that a lot too – poor Sunil Dutt and Nargis! Aa bhi jaa is indeed a lovely number. But I cannot get over my love for Chalo Ek baar phir bhi. Sigh! I think Chalo ek baar phir se scores in one way over Aa bhi jaa, and that is in the lyrics – Aa bhi jaa is pretty standard where-are-you-I’m-waiting fare; Chalo ek baar phir se is simply brilliant poetry. That. combined with the music, the rendition, and the acting, put it in a class by itself. This is probably the first time I am commenting on your blog, though I have visited it earlier. It is a lovely list, backed with very informative write-up. At least two of the songs – Chalo ek baar phir se and Jalte hain jiske liye – have acquired iconic status. Ram kare Asia ho jaye and Tum agar sath dene ka wada karo, too, are my great favourites. Ashokji has added the one I was looking for: Zindagi ke safar mein. Sunil Dutt did get some all time great songs. Congratulations for an excellent post! Sunil Dutt:, the epitome of all that was good in reel and real life.mine is a newly found ‘fan ship’ with Dutt saheb, because I was too young when he was at the height of his stardom( before the sad controversies of Sanjay engulfed him).i have tried to watch as many of his films, and can say, that in many ways he chose well in furthering the cause of secularism,and spoke up against cultural practices which oppressed women( Sujata issues on untouchables is one case in point), prejudices between Masters and servants( khandan,main chip rahungi),mother India on oppression of poor subsidiary farmers and the stronghold of carpet beggars on the poor. The velvety rendition by Rafi of song called Aap Aaye To Khayale Dil e Nuasad Aaya, ( from Gumrah with Mala sinna) and from beti Beta; Agar Teri jalwa, and from Hamraz: tum agar satay dene ka vada karo, and kissi pathar Ki Murat. To me Sunil Dutt lives on, through his films, , his songs bringing such joy, even 15 years after his passing from this earth, and his social work, and if you look at Priya Dutt his daughter, she looks so much like him……..Dutt Ji lived as he died, with dignity, respect, and the love of the people whose lives he touched.I now appreciate why my late mother never missed a Sunil Dutt film! Thank you for commenting, Susan! Among the songs you mentioned, I seem to have forgotten Main Kaun Hoon from Main chup rahungi. – need to listen to it again.